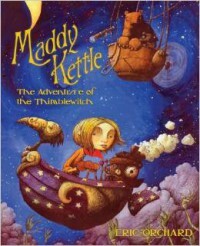 Maddy Kettle is an eleven year old who enjoys working in her parents' bookstore. In order to save her parents, Maddy must go on a dangerous journey. This was a very quick and enjoyable read. It is a fun concept that I have never seen used before: children's graphic novel. The illustrations were beautiful and absolutely perfect. The book was very whimsical in its story and characters. For example, Maddy owned a pet toad that glows and floats in the air (which must be kept on a string). I only had a problem with the resolving of the issues that had arisen during the course of the story. They were just patched over too quickly. I received this for review from Net Galley. This book was a great pallet cleanser type novel (it was a nice light read). I only wish it was a bit longer and had more substance in its resolving of the problems faced.